I know I’ve been a bit negligent around these parts lately. And for those of you who have been asking for additional Women’s World Cup coverage, I hear you too. Summer time is busy, what with a seemingly a game kicking off every 30 minutes over the last two weeks between Canada 2015, the Copa América in Chile, European Championship qualifying, Youth World Cups, international friendlies, the American domestic leagues and my broadcasting responsibilities. As such, finding time to scribe hasn’t been the easiest. But if there’s anything that will wake me from my slumber, it’s commenting on others in the world of soccer making horrendous errors in judgement. 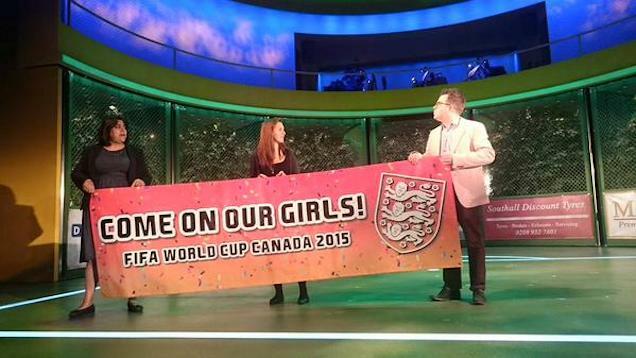 Case in point, the English FA’s attempt at supporting their surprisingly plucky ladies’ team in Canada. Yes, that’s real. No photo shop involved. In fact, it’s so real that the cast of the Bend it Like Beckham Musical — which is apparently a thing now — posed with it to help support the Lady Lions. Look, I know it’s common place in England for a team’s supporters to shout “Come on you, ____!”. But you can’t tell me that at least one person in the chain of approval for this didn’t think, to themselves “Maybe this could be interpreted differently, no?” Did anyone look at this before they decided to give it the seal approval? And while I’m also aware that the English are suckers for a snarky pun or crafty joke, this would have to be a little too misogynistic to let fly, right? If not, why not go for the full monty and hire Ron Jeremy and Peter North as your spokesman and Milk as an advertising partner?